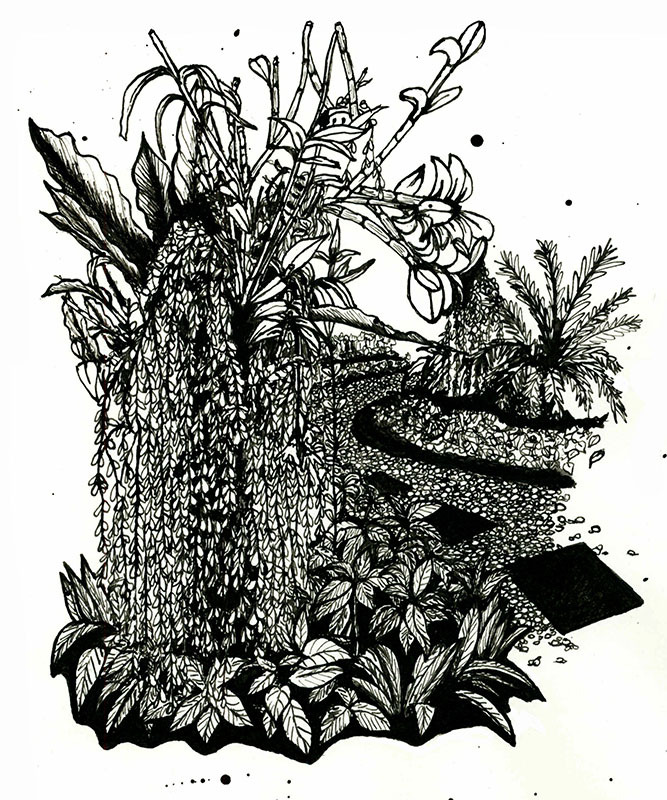 Foundation Degree (FdA) in Illustration graduate Cristina Adani travelled to southeast Asia for a break after graduating from Camberwell. We asked her to take over our blog and tell us about her trip as well as share with us her beautiful illustrations from her adventure. During my two years practicing FdA in Illustration I went to many practitioners’ speeches which highly influenced my decision to finally take a break and book my dream holiday. The one speech that stands out the most was by W+K creative Misco and their talk on, ‘Out of Office: How culture and life outside work can inspire and influence great work. They advised how you can give the creative mind space to breathe, rest, and the room to create. So, I thought after two years of solid work my mind would need fresh, inspirational input and I went for it. 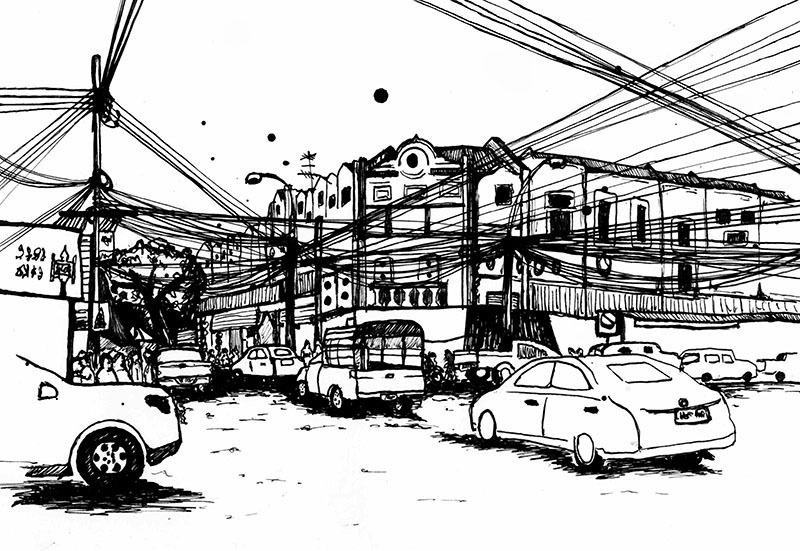 I had wanted to visit southeast Asia for a long time, but always postponed because of college and work commitments. 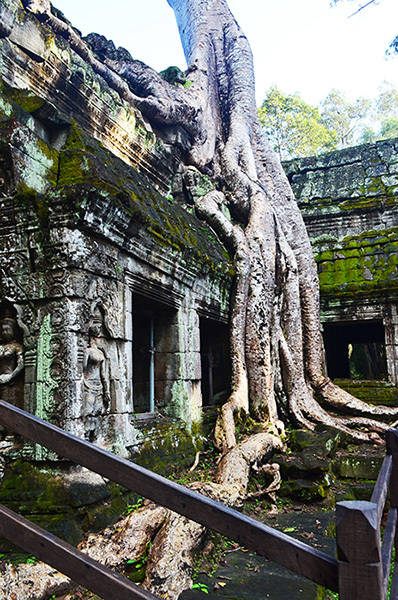 Southeast Asia is a part of the world where you can have experiences you won’t find anywhere else. The colours are brighter, the flavours are stronger, and there is a lot of history to discover. I spent 25 days travelling from Bangkok, to Thailand, Cambodia, north to south, and it taught me a lot more than I expected. I’m Italian and I have lived abroad for the past 10 years; during this time I have experienced a lot and have learnt about other cultures. There is so much to be learned by looking at and stepping into another life and seeing how people interact with each other. It’s humbling, and it allows you to think outside the box, broadening the mind. 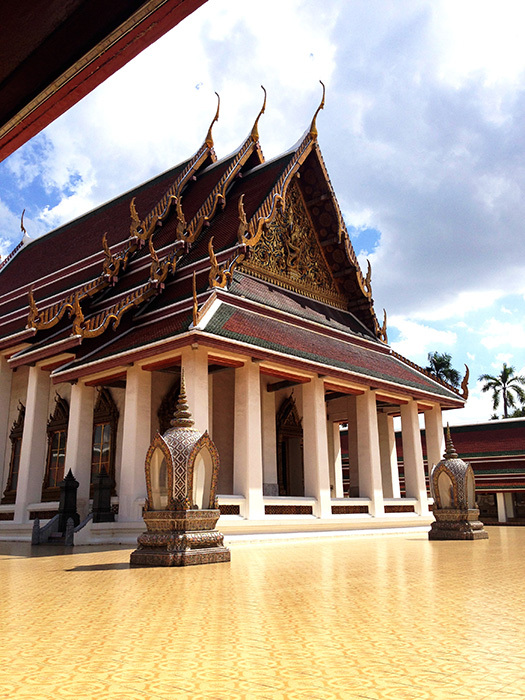 One of the things in my must-see southeast Asia list were temples; whether it’s the Grand Palace in Bangkok, or the Angkor temples of Cambodia, you learn so much about the countries by seeing holy places. I soon realised that it would be like going to Europe without seeing a church, next to impossible. When I went into my first little temple on my trip I took a lot of pictures, the colours, architecture and decoration is totally different from what you see in Europe. When I looked on the map to know the name of that magnificent piece and shimmering beauty it wasn’t even marked! I later realised that it was just a temple where local people go to pray. I was born in a country full of churches and I forget to stop to admire the majesty of what is a fundamental representation of the history of that country. Looking at things from a different perspective gives you different insights; I became aware of how many things I’ve been given and I never stopped to truly appreciate the beauty. 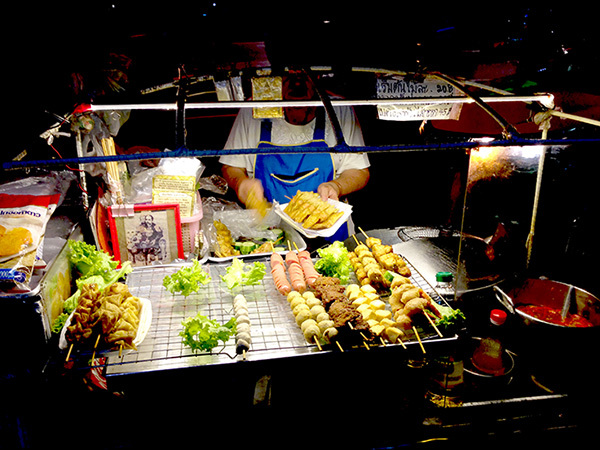 Every person I know who went to Thailand told me that street food is something I had to try, but at the same time not to trust it. The Thai capital is quite arguably the world’s greatest open-air barbecue, where doubtful hygiene conditions may scare you off, but the smell coming from that boiling pot is just too good to let you walk away without trying something. There were occasions when I ate something and I wasn’t entirely sure what it was, but I guess that is what makes the experience. The cooks are proud to have you at their stall, welcoming you with a big smile, and the taste of the food has nothing to do with any Thai food I’ve tried in Europe. I found Asia is equipped with vibrant markets with quirky charms; shopping in southeast Asia is unrivalled and you have to be ready to negotiate for the best price. Especially in markets like Chatuchak in Bangkok, where everything is cheap, but they always offer an increased price to a western-looking tourist. Cambodia more than Thailand is a country where motorbikes rule the roads; their rule is there are no rules. They drive on the opposite side of the street, there is no red light that stops them, you see them with three to five people (children too of course) on a scooter, without helmets and carrying the most weird and dangerous kind of things you could imagine; from gas tanks to huge fish traps, or enormous buckets full of meat and big blocks of ice. The things I saw I cannot imagine comparing to things I’m used to in Europe. Among the madness of a no-rule street code, I actually enjoyed riding a bike and finding myself merging really fast with the culture, probably pushing through the urge of escaping a reality where everything is the opposite; controlled and regulated. Women adorned in pyjamas, with their children at all hours of the day will shout “Hello!” at you, leaving you with the biggest grin on your face. Asia is a beautiful place and the people are generally very happy, the amount of joy that the people, who own practically nothing, are able to convey with just a simple smile is something I hadn’t seen for a very long time. I’ve noticed in Europe people seem to have forgotten this. 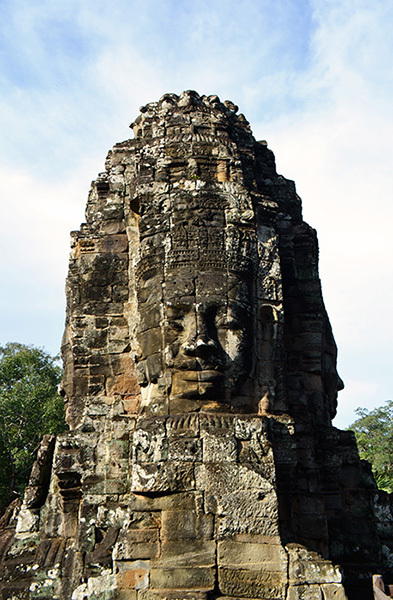 Siem Reap, the most visited city in Cambodia, is a gateway to the UNESCO World Heritage temples of Angkor. I was longing for the moment, to see in person the largest religious monument in the world which everybody talks about after coming back from their holiday here. 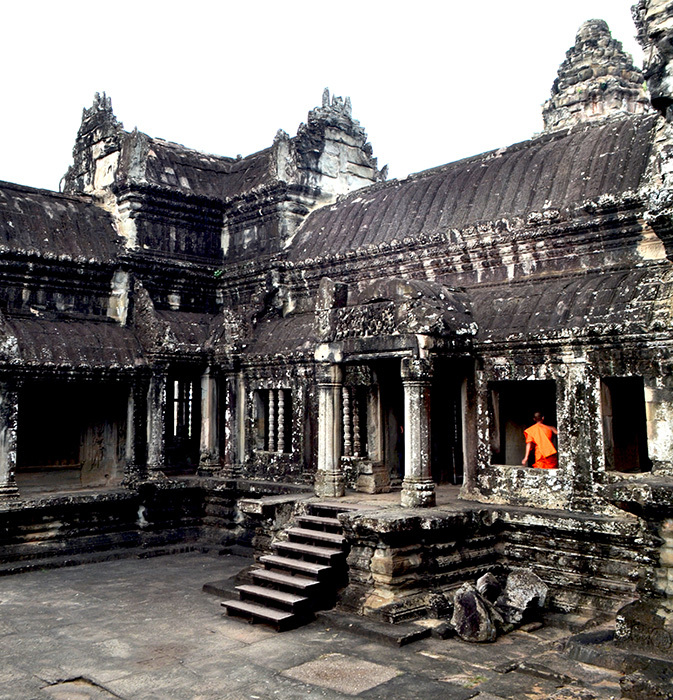 Angkor Wat was really mind-blowing, I didn’t know how large the Angkor city is until I was there. 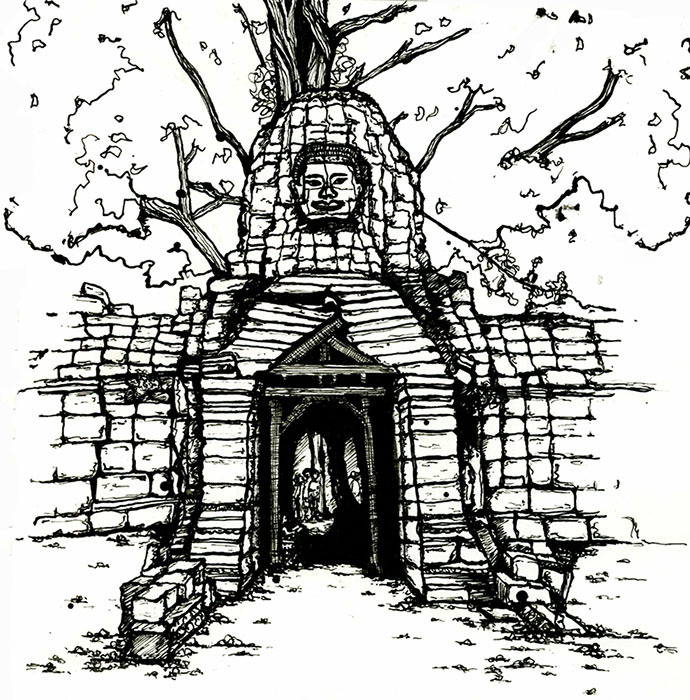 There are temples in which limbs of trees have grown out of any surface, warping the walls. 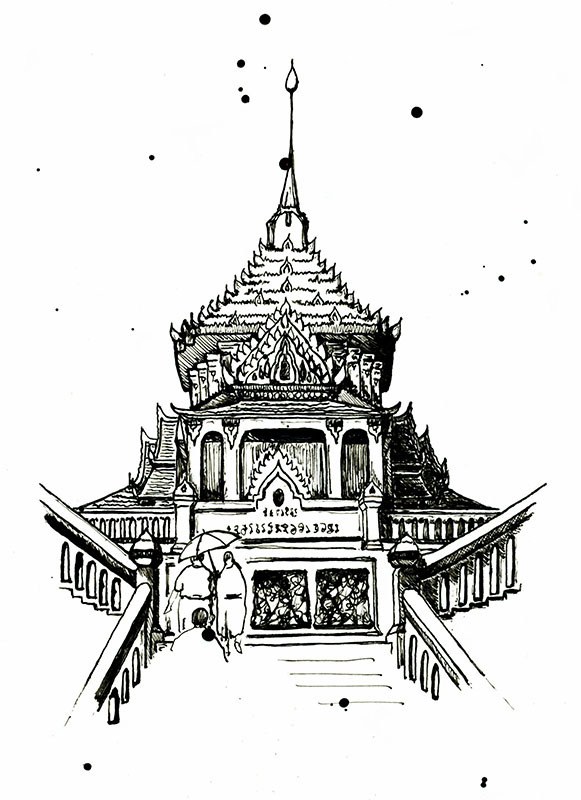 There are temples in the middle of a lake, which you could reach only by walking on a narrow wooden bridge, and temples hidden in the middle of the jungle where it is still a bit dangerous to go because of the land mines put there by the Khmer Rouge (the followers of the Communist Party of Kampuchea in Cambodia in 1968). In fact, Phnom Penh, capital of Cambodia is crucial to understanding how history has shaped the country and how the culture and people have evolved in the last few decades. The visit at the Tuol Sleng Genocide Museum made me reflect quite a bit; I knew the country was terribly impoverished, but knew little of the realities of its hardships. I knew nothing of the people or the lives they led, but learnt how each and every family is the victim of this great tragedy. This holiday gave me something that people usually say they don’t have: time. I had time to really think about where I want to go and what I want to achieve. Losing myself in a different culture, discovering new things every day was a constant source of inspiration with new ideas to start and approach new projects with a different mind-set; more energetic and lively. I want more of this, time to be with people who inspire me to do more of what I love. It’s not just about art, it’s about the experiences I can have to connect with so many people which inspire me in different ways. I feel time is the only thing we have to experience life, so make it count!